After a rain-soaked Sunday morning when torrential storms lashed most of the island, it was a relief to see the clouds clear and a glimmer of sunshine greeting the afternoon that was to be a Beautiful Sunday. This is the title of Esplanade’s free series of Sunday afternoon concerts that showcases Singapore’s non-professional and community musical groups. 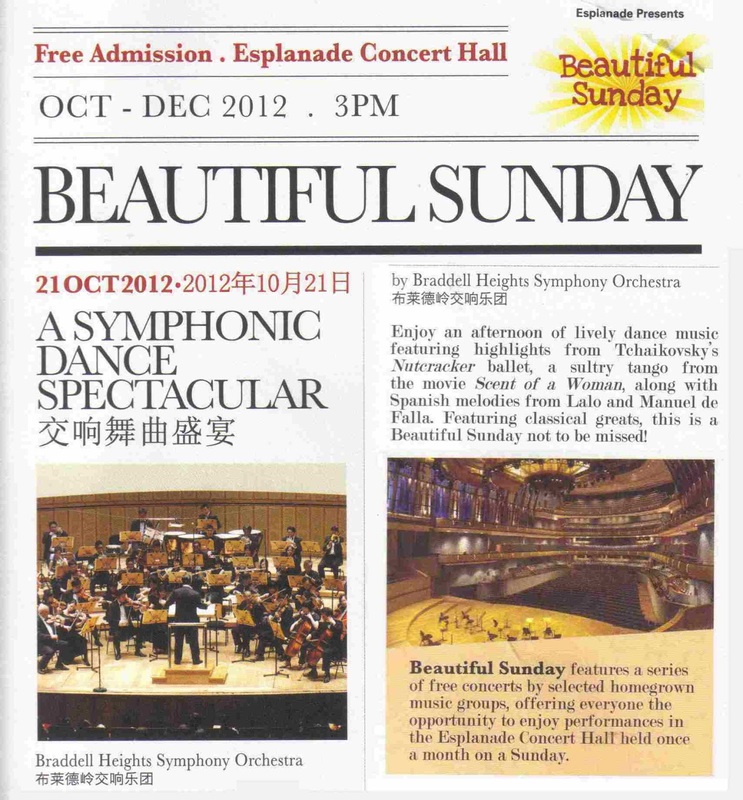 The featured group today was the Braddell Heights Symphony Orchestra (BHSO), Singapore’s only community orchestra, led by its newly appointed Music Director Adrian Tan. It was not so beautiful trying to get into the hall, with a very long queue snaking through the Esplanade foyer before one actually finds the seats. All the stalls, Circles One and Two seats had been filled, and one has to be satisfied sitting near the ceiling of the 1600-capacity Esplanade Concert Hall in Circle Three. But what a view it affords, and the sound is pretty decent too. A spectacular view of Esplanade Concert Hall from Circle Three. The BHSO is often seen as the Cinderalla of local orchestras, not known for precision playing or sumptuous sound, but rather for its enthusiasm and can-do attitude. However within the reverberant acoustics and vast expanse of Esplanade this afternoon, it now sounds like a princess among orchestras. Credit goes to young conductor Tan who has injected a certain immediacy and revitalised spirit into its playing, opening with Johann Strauss the Younger’s bubbly Die Fledermaus Overture. Taken at the right speed, the music sparkles like champagne and there was never a hint of strain in this fizzy curtain-raiser. The orchestra also looks a great deal more youthful, and this was only matched by a very enthused audience that comprised mostly families with young children. Amazingly this was a very attentive group of listeners which applauded vociferously and appropriately, and not in between movements from Tchaikovsky’s Nutcracker Suite. The Trepak was brought off with vigour, and the three flutes shone in the Dance of the Reeds, before rounding off with a rousing Dance of the Flowers. Two young soloists also joined the orchestra in concertante works. 12-year-old violinist Wu Shuang (above in red) was a most confident soloist in the final movement of Lalo’s Symphonie Espagnole. She projected very well and could be clearly heard all the way up in Circle Three, while her intonating and articulation was spot on. Someone double her age would have been more than proud with her showing. Somewhat older was Siew Yi Li who performed the solo in Carlos Gardel’s Por una cabeza. His stylish insouciance lent the sultry music its much needed sexiness, and he was joined by piano and accordion for this number (below). In between the orchestra filled in with Manuel de Falla’s Ritual Fire Dance, played with much verve. To close, BHSO let down its collective hair for a medley of Duke Ellington tunes. A drumset provided the rocking beat, and the orchestra was beginning to sound like the Boston Pops. Solo trumpet and oboe stood out in their melodies, and the deep Southern drawl coaxed by the clarinet gave much atmosphere to the closing It Don't Mean A Thing (If It Ain't Got That Swing). This orchestra certainly had that swing for this music, and it was refreshing to see how it switched modes from classical to jazz comfortably, as if with a flick of the baton. The encore was Offenbach’s high-kicking Cancan from Orpheus in the Underworld, to which the audience spontaneously clapped along without any coaxing. Clearly it was in the same groove as the orchestra, and I could not tell which was enjoying itself more. Young conductor Adrian Tan has begun his Phase One in rejuvenating this orchestra; one cannot wait to see how Phase Two turns out. The friendly folk of BHSO, catching a drink at Harry's post-concert. To conductor Adrian Tan's left is the visiting Russian pianist Ilya Rashkovskiy, a future soloist with the orchestra.